I’m pleased to announced a project I’ve been working on alongside Rich Mix Cultural Foundation on Bethnal Green Rd in East London, Brazilian record label Mais Um Discos, Latin music promoters Movimientos and Coletivo Rua in Brazil. Joga Bola! 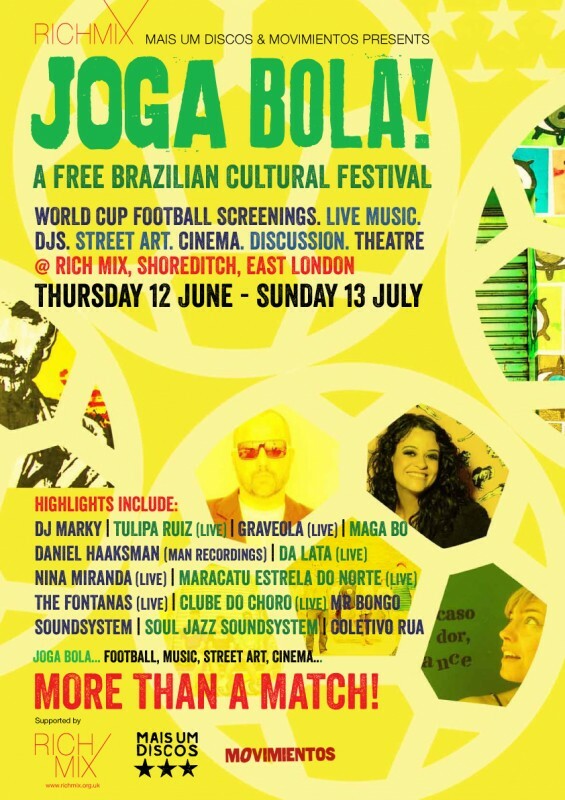 is a festival of Brazilian Music, Cinema, Theatre and Street Art that will run alongside the World Cup. My involvement so far has been in curating and inviting street artists from Brazil, who will be painting a mural, installation a two month long exhibition and giving workshops in stencil art and screenprinting. Artists include Daniel Melim and SHN who as well as being great friends are producing fantastic work and I’m sure will make a great impact at Joga Bola. 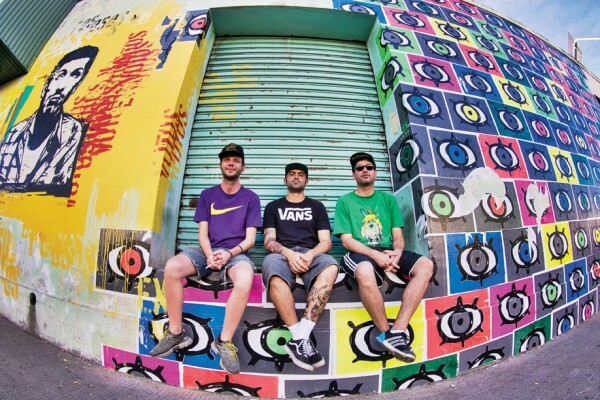 Brazil is renowned for its progressive D-I-Y street art and Joga Bola! is proud to present debut London shows for trail-blazing artists Daniel Melim and the SHN Collective. Both will take-over Rich Mix creating a special mixed media mural in the main space, an installation in the mezzanine space created from hundreds of silkscreen posters featuring graphic icons combined with stencil art, DIY art workshops and creating other ad-hoc art ‘occupations’ around the venue. 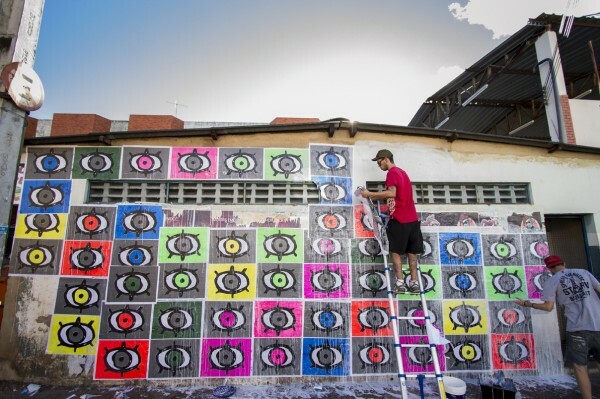 Stencil Maestro Daniel Melim is one of Sao Paulo’s much admired street artists whose murals – playful colourful twists on pop culture – can be found across Sao Paulo city, who has exhibited at MASP and Afro-Brasil Museumand works on projects with young people in the Ferrazopolis favela. Joining him will be members of the legendary poster art collective SHN, one of Brazil’s firstDIY art collectives known for their street actions, exhibitions and collaborative multimedia projects they call ‘occupations’ that see videos, projections, silkscreen stickers and posters DJs, performers and multiple artists ‘occupying’ public spaces.